What this means for distillers and would-be distillers alike is that gin is actually one of the easiest spirits to make—because "making" it really just means getting botanicals into existing alcohol. And that is a lot easier to tackle than the crazy world of fermenting and distilling. And here to aid you in your gin-making ambitions is the Homemade Gin Kit, providing everything you need to transform a bottle of plain old vodka into a vibrant, intricately spiced gin. 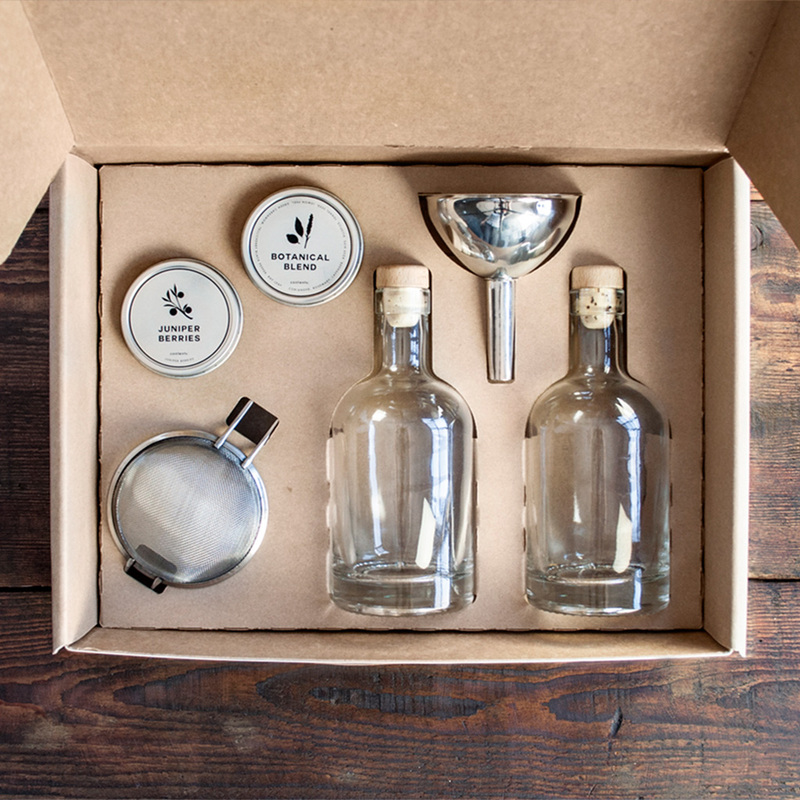 Included in the kit are bottles, strainers and funnels, along with juniper berries and botanicals. It’s those botanicals that are so important—more than anything else, that's what determines the flavor of a given spirit. The kit's botanicals include a range of spices, herbs and citrus peels, among them rosemary, lavender, fennel seed, lemon peel and cardamom. There is also a "Smoky Blend," featuring Lapsang Souchong tea, and a "Holiday Spice Blend" with cinnamon, cloves, rosemary and ginger for those of you who want something interesting to bring to your next holiday party. All you have to do? Add the ingredients to a bottle of vodka and let them infuse for 36 hours. Strain the gin and pour away for your favorite G&T, Tom Collins or Negroni. The kit's makers also included two 375-milliliter bottles, in case you want to give away part of your creation. Seems unlikely to use, but it's nice of them to think that way.